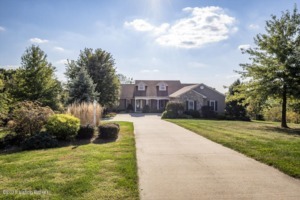 Beautiful 5BR, 3.5BA home in Sparta, KY overlooks rolling hills and a stocked pond with a fountain feature. This property is a little slice of heaven! Located minutes from the Glencoe exit, this gorgeous home is open and light, with hardwood floors, crown molding, and fresh paint. The open floor plan inside, spacious finished walkout lower level, and the freshly painted 2 tier deck make this home perfect for entertaining. The kitchen boasts cherry cabinets, a huge breakfast bar, large eat-in area, and stainless steel appliances. Large study with built-in bookcases and a stone fireplace. You will want to sit back and relax on the back deck. The home has been well maintained and features a new water heater installed in 2016. The sellers are offering a 1 yr home warranty for added security! Click to schedule your showing.